A heavy-duty garbage bag should be a core item of any survival kit. In a backcountry emergency or survival situation—especially in cold, rainy, and/or windy conditions—a garbage bag can quickly and easily be used as an outer layer for both protection and warmth. A 55-gallon contractor bag in action. To do so, cut a slit or hole no longer than your face along the side of the garbage bag, with the upper end beginning about eight inches down from the corner. This allows you to use the corner as a hood and provides protection and warmth for your head. Next, consider the pros and cons of cutting arm holes. While these provide you the option of using your arms while still covering your torso and head, they also create two entry points for heat-stealing moisture and wind. In dire situations, where maximizing warmth and protection are essential to survival, your best option may be to forgo arm holes. In less serious conditions, they might be worth considering. Once you’ve got the garbage bag set, pull it over your body and do your best to seal the open bottom around you. This will help reduce the heat loss caused by the “chimney effect,” which occurs when your body-warmed air escapes from your face slit (or arm holes) and is replaced by colder air from the bottom. A few other things to consider. Garbage bags are not breathable of course, which means that they will trap any moisture inside. 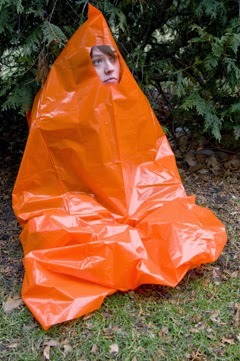 As a general rule, a garbage bag survival poncho is best utilized when you are not moving (and sweating), such as situations when you may be immobilized due to injury or are staying put for other reasons. The best garbage bags for survival kits are large, thick (3 to 4 mil), and heavy-duty, such as lawn and leaf bags, or contractor-type bags used at construction sites. Bright colors are easier for potential rescuers to spot, but require some effort to find for sale. One good option (along with lots of other great survival advice and equipment), can be found at OutdoorSafe.com, which sells a thick, bright 4 mil orange bag for $3.